Asano, Takeji "Snow In Toji Temple" - Woodblock - Chinese and Japanese woodblock prints for sale, silkscreen, scrolls, watercolor, lithographs. Artwork Details for Asano, Takeji "Snow In Toji Temple"
Condition: Fine impression and condition. Full margins; No tears, creases, foxing or stains. A dog-ear fold at top left margin corner (does not enter the image area). 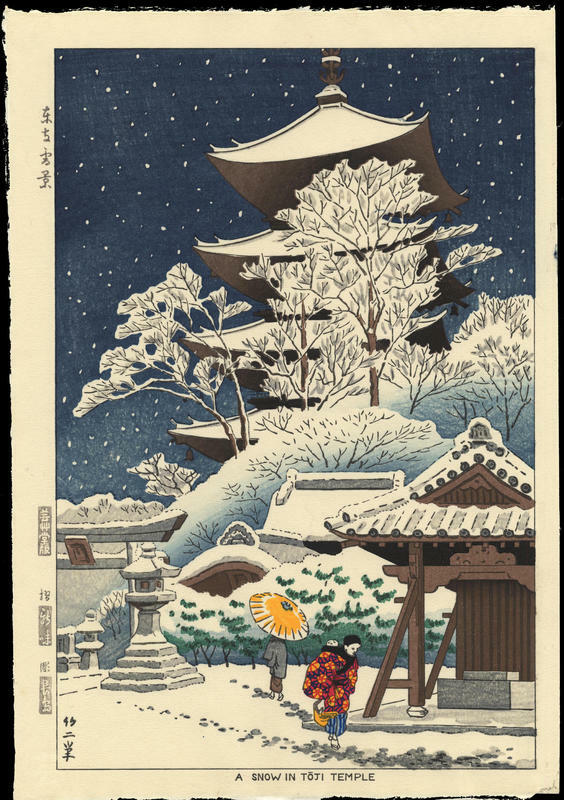 Notes: A fine pagoda snow scene in oban tate-e format by Asano. This is a mid-edition by the original Unsodo printer of the first edition (Shinmi), not by the recent Unsodo printer. In the margins are title, Unsodo publisher's seal, printer's seal, carver's seal, and Unsodo 'Gei' watermark. Asano signature at right of image. The cut-out in the bottom corner (known as a 'kento cut') is due to the printing process.